This Encyclopedia is the most comprehensive guide yet both to the nature and content of literature, and to literary criticism. In ninety essays by leading international critics and scholars, the volume covers both traditional topics such as literature and history, poetry, drama and the novel, and also newer topics such as the production and reception of literature. Current critical ideas are clearly and provocatively discussed, while the volume's arrangement reflects in a dynamic way the rich diversity of contemporary thinking about literature. Each essay seeks to provide the reader with a clear sense of the full significance of its subject as well as guidance on further reading. 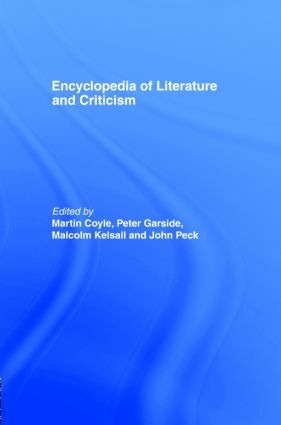 An essential work of reference, The Encyclopedia of Literature and Criticism is a stimulating guide to the central preoccupations of contemporary critical thinking about literature.